Home Latest News Thailand News Found Alive! Mae Sai, Thailand (AP) – The 12 boys and soccer coach found in a partially flooded cave in northern Thailand after 10 days are mostly in stable medical condition and have received high-protein liquid food, officials said Tuesday, though, at the time of Pattaya Mail going to press, it was not known when they would be able to go home. Video released early Tuesday by the Thai navy showed the boys in their soccer uniforms sitting on a dry area inside the cave above the water as a spotlight, apparently from a rescuer, illuminated their faces. The boys were found late Monday night during a desperate search that drew international help and captivated the nation. When the group will be able to leave the cave isn’t known due to flooding and other factors that could make their extraction dangerous. Experts have said it could be safer to simply supply them where they are for now. Thailand’s rainy season typically lasts through October. Chiang Rai Gov. Narongsak Osatanakorn said Tuesday morning that a navy SEAL team will make the final call on the evacuation method. He said one method being considered is for the group to be coached to swim using special breathing masks. He said other efforts will continue, such as draining water from the cave and exploring the mountainside for shafts and other entrances to the caverns below. Family members of the missing hugged each other and cheered as they heard they had been found. Aisha Wiboonrungrueng, the mother of 11-year-old Chanin Wiboonrungrueng, smiled and hugged her family as news of their discovery spread. 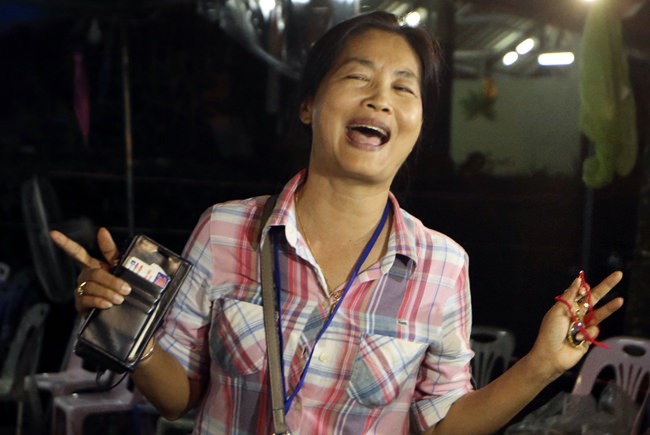 She said she would cook her son a Thai omelet, his favorite food, when he returns home. Rescue divers had spent much of Monday making preparations for a final push to locate the lost soccer players, aged 11 to 16, and their 25-year-old coach. Flooding trapped them after they entered the Tham Luang Nang Non cave in Chiang Rai on June 23. 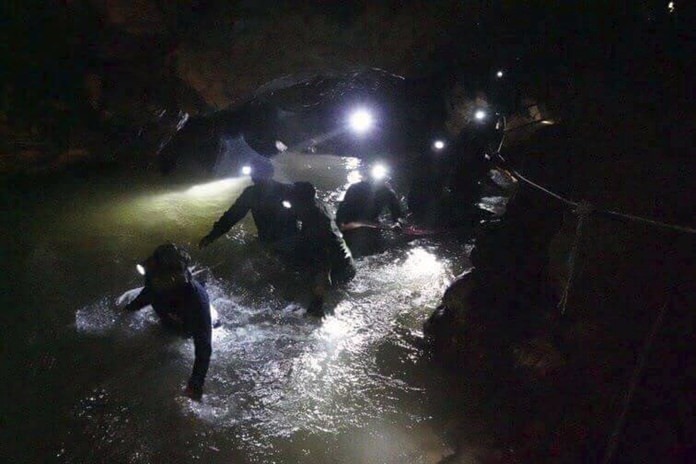 Divers found the group about 300-400 meters (yards) past a section of the cave on higher ground that was thought to be where they might have taken shelter. Then the boy breaks into simple English, saying, “Eat, eat, eat,” to which another voice responds in Thai that he already told that to the rescuer. Narongsak said Tuesday that the missing were given high-protein liquid food, painkillers and antibiotics. He said doctors had advised giving the medicine as a preventative measure. “The Royal Thai Government and the Thai people are grateful for this support and cooperation, and we all wish the team a safe and speedy recovery,” Prayuth’s office said in a statement. The rescuers had been stymied repeatedly by rising water that forced divers to withdraw for safety reasons. When water levels fell Sunday, the divers went forward with a more methodical approach, deploying a rope line and extra oxygen supplies along the way. Interior Minister Anupong Paojinda said Tuesday heavy rains forecast for the coming days could worsen floods, forcing authorities to speed up their extraction. The boys may need to swim out using diving equipment ahead of the bad weather. He said they plan to bring the boys out via the same complicated route through which their rescuers entered. 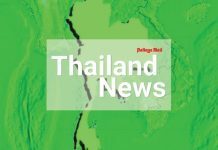 While efforts are to pump out the floodwaters continue, Anupong said it’s clear some area cannot be drained and in order to get out the boys may need to use diving gear while being guided by two professional divers each.